BGO Casino are celebrating the launch of the new NetEnt videoslot When Pigs Fly by offering a super welcome package: 5 no deposit free spins on When Pigs Fly, 20 no deposit free spins on Starburst, 200% bonus on your first deposit up to €/£200, plus up to 280 extra free spins on the aforementioned slots! BGO will instantly add your 5 free spins on When Pigs Fly slot and 20 free spins on Starburst! To top it all off BGO will drop 180 extra Starburst spins on your first deposit. NEW PLAYERS WILL RECEIVE 5 FREE SPINS ON WHEN PIGS FLY, NO DEPOSIT REQUIRED (ONLY AVAILABLE TO PLAYERS FROM THE UNITED KINGDOM, AUSTRALIA, NEW ZEALAND, GERMANY, AUSTRIA, SWEDEN, FINLAND, NORWAY) + 20 FREE SPINS ON STARBURST AVAILABLE FOR ALL ELIGIBLE PLAYER COUNTRIES. ON FIRST DEPOSIT PLAYERS RECEIVE ONE HUNDRED AND EIGHTY (180) FREE SPINS AT TWENTY (20) SPINS PER DAY ON STARBURST FOR THE 9 DAYS FOLLOWING THE PLAYER’S FIRST DEPOSIT. ANY WINNINGS FROM THE FREE SPINS WILL BE APPLIED TO THE PLAYER’S BONUS FUNDS AND WILL BE SUBJECT TO OUR STANDARD BONUS TERMS, WAGERING REQUIREMENTS AND GAME WEIGHTINGS. BONUS FUNDS MUST BE WAGERED THIRTY-FIVE (35) TIMES BEFORE THEY ARE CONVERTED TO REAL MONEY AND CAN BE WITHDRAWN. NOT ALL GAMES AT BGO WILL CONTRIBUTE TO WAGERING REQUIREMENTS. THIS PROMOTION IS DESIGNED FOR SLOTS PLAYERS WHERE EVERY £/€1 STAKED COUNTS TOWARDS THE TARGET BUT PLEASE CHECK OUR GAME WEIGHTINGS TO UNDERSTAND WHAT YOUR PREFERRED GAMES CONTRIBUTE. THE BONUS FUNDS (WINNINGS) ARE VALID FOR 3 DAYS FROM THE MOMENT THEY ARE AWARDED TO YOUR ACCOUNT. IF THE 35 TIMES WAGERING REQUIREMENT IS NOT COMPLETED IN FULL BEFORE THEY EXPIRE, ANY BONUS AND WINNINGS WILL BE FORFEITED. PLAYERS WILL RECEIVE A 200% BONUS ON THEIR FIRST DEPOSIT CAPPED AT £/€200 WHEN ENTERING BONUS CODE WPF200. A MINIMUM DEPOSIT OF £/€10 IS REQUIRED TO TRIGGER THE BONUS. THE BONUS MUST BE CLAIMED WITHIN 3 DAYS OF THE PLAYER MAKING THEIR FIRST DEPOSIT INTO BGO OR ANY UNUSED BONUSES AS PART OF THE WELCOME PACKAGE WILL EXPIRE. NOT ALL GAMES AT BGO WILL CONTRIBUTE TO WAGERING REQUIREMENTS. THIS PROMOTION IS DESIGNED FOR SLOTS PLAYERS WHERE EVERY £/€1 STAKED COUNTS FULLY TOWARDS THE TARGET BUT PLEASE CHECK OUR GAME WEIGHTINGS TO UNDERSTAND WHAT YOUR PREFERRED GAMES CONTRIBUTE. PLAYERS HAVE 14 DAYS TO COMPLETE THE WAGERING REQUIREMENTS ON EACH INDIVIDUAL BONUS. IF WAGERING REQUIREMENTS ARE NOT COMPLETED IN FULL BEFORE THE BONUS EXPIRES, ANY BONUS AND WINNINGS WILL BE FORFEITED. WHEN A BONUS IS ACTIVE IN A PLAYER’S ACCOUNT, STAKES MUST NOT EXCEED £/€10 ON ANY GAME OR ALL WINNINGS FROM ANY PLAY INVOLVING USE OF THE BONUS WILL BE VOID. THIS EXCLUSIVE BONUS IS NOT AVAILABLE TO CUSTOMERS DEPOSITING INTO BGO USING NETELLER OR SKRILL AS A PAYMENT METHOD. IS ONLY AVAILABLE TO NEW BGO ACCOUNTS AND ONCE PER PERSON/ACCOUNT. THE WELCOME PACKAGE APPLIES TO PLAYERS ACROSS ALL BGO PRODUCTS EXCEPT BINGO WHERE AN ALTERNATIVE WELCOME OFFER IS AVAILABLE. PLAYERS MUST SELECT THE DEPOSIT OFFER (200%) WHEN MAKING THEIR FIRST DEPOSIT INTO BGO AND THEN ACCEPT THE OFFER WHEN PROMPTED. CHOOSING THIS WELCOME PACKAGE EXCLUDES PLAYERS FROM TAKING UP THE BINGO WELCOME OFFER AND VICE VERSA. 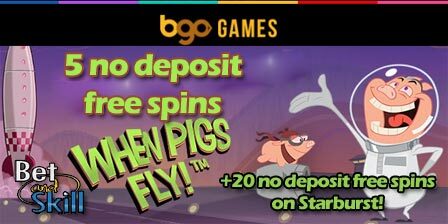 "BGO Casino 25 no deposit free spins on When Pigs Fly and Starburst Slot"